This acculturation was originally proposed by George Washington and was well under way among the Cherokee and Choctaw by the turn of the 19th century. In an effort to assimilate with American culture, Indians were encouraged to "convert to Christianity; learn to speak and read English; and adopt European-style economic practices such as the individual ownership of land and other property (including, in some instances, the ownership of African slaves)." Thomas Jefferson's policy echoed Washington's proposition: respect the Indians' rights to their homelands, and allow the Five Tribes to remain east of the Mississippi provided that they adopt behavior and cultural practices that are compatible with those of other Americans. Jefferson encouraged practicing an agriculture-based society. Andrew Jackson sought to renew a policy of political and military action for the removal of the Indians from these lands and worked toward enacting a law for Indian removal. In his 1829 State of the Union address, Jackson called for removal. The Indian Removal Act was put in place to give to the southern states the land that Indians had settled on. The act was passed in 1830, although dialogue had been ongoing since 1802 between Georgia and the federal government concerning such an event. Ethan Davis states that "the federal government had promised Georgia that it would extinguish Indian title within the state's borders by purchase 'as soon as such purchase could be made upon reasonable terms'". As time passed, southern states began to speed up the process by posing the argument that the deal between Georgia and the federal government had no contract and that southern states could pass the law themselves. 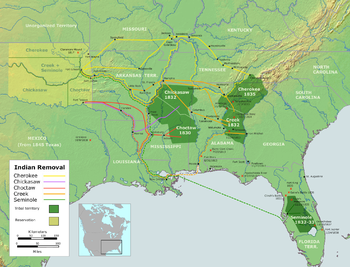 This scheme forced the national government to pass the Indian Removal Act on May 28, 1830, in which President Jackson agreed to divide the United States territory west of the Mississippi into districts for tribes to replace the land from which they were removed. In the 1823 case of Johnson v. M'Intosh, the United States Supreme Court handed down a decision stating that Indians could occupy and control lands within the United States but could not hold title to those lands. Jackson viewed the union as a federation of highly esteemed states, as was common before the American Civil War. He opposed Washington's policy of establishing treaties with Indian tribes as if they were foreign nations. Thus, the creation of Indian jurisdictions was a violation of state sovereignty under Article IV, Section 3 of the Constitution. As Jackson saw it, either Indians comprised sovereign states (which violated the Constitution) or they were subject to the laws of existing states of the Union. Jackson urged Indians to assimilate and obey state laws. Further, he believed that he could only accommodate the desire for Indian self-rule in federal territories, which required resettlement west of the Mississippi River on federal lands. Jackson viewed the demise of Indian tribal nations as inevitable, pointing to the advancement of settled life and demise of tribal nations in the American northeast. He called his northern critics hypocrites, given the North's history. Indian tribes had become nearly extinct, Indian hunting grounds had been replaced with family farms, and state law had replaced tribal law. If the Indians of the south were to survive and their culture be maintained, they faced powerful historical forces that could only be postponed. He dismissed romantic portrayals of lost Indian culture as a sentimental longing for a simpler time in the past, stating that "progress requires moving forward." Humanity has often wept over the fate of the aborigines of this country and philanthropy has long been busily employed in devising means to avert it, but its progress has never for a moment been arrested, and one by one have many powerful tribes disappeared from the earth. ... But true philanthropy reconciles the mind to these vicissitudes as it does to the extinction of one generation to make room for another. ... In the monuments and fortresses of an unknown people, spread over the extensive regions of the West, we behold the memorials of a once powerful race, which was exterminated or has disappeared to make room for the existing savage tribes. . Philanthropy could not wish to see this continent restored to the condition in which it was found by our forefathers. What good man would prefer a country covered with forests and ranged by a few thousand savages to our extensive Republic, studded with cities, towns, and prosperous farms, embellished with all the improvements which art can devise or industry execute, occupied by more than 12,000,000 happy people, and filled with all the blessings of liberty, civilization, and religion? According to historian H. W. Brands, Jackson sincerely believed that his population transfer was a "wise and humane policy" that would save the Indians from "utter annihilation". Brands writes that, given the "racist realities of the time, Jackson was almost certainly correct in contending that for the Cherokees to remain in Georgia risked their extinction". Jackson portrayed his paternalism and federal support as a generous act of mercy. The Removal Act paved the way for the forced expulsion of tens of thousands of American Indians from their land into the West in an event widely known as the "Trail of Tears," a forced resettlement of the Indian population. The first removal treaty signed was the Treaty of Dancing Rabbit Creek on September 27, 1830, in which Choctaws in Mississippi ceded land east of the river in exchange for payment and land in the West. The Treaty of New Echota was signed in 1835 and resulted in the removal of the Cherokee on the Trail of Tears. ^ "Indian Removal Act: Primary Documents of American History". Library of Congress. Retrieved May 12, 2011. ^ The "Indian Problem". 10:51-11:17: National Museum of the American Indian. March 3, 2015. Event occurs at 12:21. Retrieved April 16, 2018. When you move a people from one place to another, when you displace people, when you wrench people from their homelands ... wasn't that genocide? We don't make the case that there was genocide. We know there was. Yet here we are. ^ Lewey, Guenter (September 1, 2004). "Were American Indians the Victims of Genocide?". Commentary. Retrieved March 8, 2017. Also available in reprint from the History News Network. ^ "Indian Removal". PBS Africans in America: Judgment Day. WGBH Educational Foundation. 1999. ^ These tribes were referred to as the "Five Civilized Tribes" by Colonial settlers. ^ "Trail of Tears". History.com. A+E Networks. 2009. ^ Jefferson, Thomas (1803). "President Thomas Jefferson to William Henry Harrison, Governor of Indiana Territory". Retrieved 2012-07-14. ^ Jackson, Andrew. "President Andrew Jackson's Case for the Removal Act". Mount Holyoke College. Retrieved May 28, 2013. ^ "Andrew Jackson calls for Indian removal – North Carolina Digital History". www.learnnc.org. Retrieved 2015-04-07. ^ Davis, Ethan. "An Administrative Trail of Tears: Indian Removal". The American Journal of Legal History. 50 (1): 50–55. ^ "Indial Removal 1814–1858". Public Broadcasting System. Retrieved 2009-08-11. ^ "Indian Removal Act". A&E Television Networks. 2011. Archived from the original on March 8, 2010. Retrieved February 20, 2012. ^ "Timeline of Removal". Oklahoma Historical Society. Retrieved 18 January 2019. ^ "Statements from the Debate on Indian Removal". Columbia University. Retrieved March 21, 2014. ^ "To Order Engrossment and Third Reading of S. 102". GovTrack. 2013-07-07. Retrieved 2013-10-21.